I've recently been made aware of the heated and sometimes vicious debate between phonics and whole-language reading curricula. There is worthwhile information to be found from evaluating the relative merits and detriments of each system, yes, but ultimately I believe the entire argument is a waste of time. I think the underlying premise is bogus: that reading is a skill to be artificially taught. I say reading is a skill to be naturally learned. School never taught me to read. No classroom ever showed me anything about language that I didn't already know. When in eighth grade we began diagramming sentences, I already knew exactly what to do-- not because I had previously been explicitly told how the parts of speech were arranged in any sentence, but because the diagramming was an obvious visual representation of how each sentence felt to me. For this reason, I found the task of diagramming simple and delightful, not difficult or tedious. It's only in the past few years that I've come to understand that most people find reading to be difficult and tedious. Most modern children are taught to read as an artificial process of decoding sound, and I rely on this fact for many of my acting-class demonstrations. When approaching a piece of text, most people's brains switch into "reading mode" where they produce the language sounds in a stilted, toneless manner, unable to understand what they have said until they have heard themselves say it. They must decode and "hear" the text before they can penetrate to its meaning. This is surely the result of being taught to read unnaturally. It seems evident to me that phonemic training is unnatural. One big clue is that the modern concept of "phoneme" only came into existence in the 1920's, and people had already been reading and writing for quite some time. Although "phonics" might seem to produce a drastic boost in reading skill (especially for remedial students), I suspect that this is because young children are able to produce words from the page where they could not before, and their comprehension of the words is evaluated only as a secondary measure. As they grow older, this apparent advantage will disintegrate as their texts become more and more complex and their trained-in need to "sound it out" becomes a debilitating crutch. I cdnuolt blveiee taht I cluod aulaclty uesdnatnrd waht I was rdanieg. The phaonmneal pweor of the hmuan mnid, aoccdrnig to rscheearch at Cmabrigde Uinervtisy, it denos't mtater in waht oredr the ltetres in a wrod are, the olny iprnoatmt tihng is taht the frist and lsat ltteer be in the rghit pclae. The rset can be a taotl mses and you can sitll raed it wouthit a porbelm. Tihs is bcuseae the huamn mnid deos not raed ervey lteter by istlef, but the wrod as a wlohe. Amzanig, huh? I awlyas tghuhot slpeling was ipmorantt. Are you using the same reading method you learned in elementary school to read college-level materials? Have you ever finished reading a sentence or paragraph and not remembered a single thing? Do you subvocalize or fixate? This is not, however, an argument for whole-language training methods. Whole language training appears to be poorly defined (each explanation I find seems wildly different) but a consistent feature of whole-language is its "top-down" approach. A student is expected to infer the letter sounds from the words they recognize. However, knowing words does not mean you'll automatically become aware of the phonemes in those words (Morais et al, 1979). This possibility has led at least one detractor to sneer that whole-language method requires a student to memorize the visual shapes of thousands of words, while phonics training only requires memorization of a relatively tiny set of components. The inherent fallacy is the idea that reading requires a new set of symbolic coding to be taught and memorized. Written language is a stream of communication between writer and reader; vocal sound is the same coding made audible. When someone begins speaking to me, I don't attempt to detect component sounds, categorize them into a finite phonemic set, and then combine the sounds to discover their meaning; I interpret meaning directly from the combined sounds as they are presented. Where I don't recognize a word's meaning, I can make strong inferences. For example, given the sentence "I love to eat candied splorg in the morning," I know the speaker loves a thing; it is edible; it can be candied (perhaps it is a fruit); he eats it regularly; it is a breakfast food. There are so many contextual clues that I hardly need to notice splorg; the sound of the word is essentially irrelevant, whether I am hearing it or reading it. Linguistic communication is an active, continuous deductive process. Reading does not require coded information to be taught and memorized because the codes have already been learned and memorized in normal speech. Written language is merely a representation of what we already know. We don't need to memorize the shapes of the words; we don't need to identify components and laboriously piece them together. All we need are the specific clues and cues which will allow us to receive and interpret the total communication stream. For navigation all we need is our understanding of the auditory language experience; and, as guideposts-- the sounds of the individual letters. To read properly, we don't need to newly learn the coding of phonemes, syllables, or words; all we need is our existing linguistic knowledge and the basic cues of the individual letters. So why bother to learn intervals and chords? According to my current understanding of music-language, intervals are "phonemes" and chords are "syllables", and if that's so then what I've just said is essentially that all we need to explicitly learn are pitch sounds (the "letters"). I suppose it's a matter of use. If you intended to transcribe the spoken word fragile, you would mentally capture the word-concept, then separate it into fra and gile, and then you would write the individual letters, already knowing that the complete word used g not j, i not y, f not ph, etc. It seems that you would learn intervals and chords mainly to write, and you would learn pitches mainly to read. The current question is how pitch and interval training are transferred outside of the ear-training games. What is the process? How does this ear training become actual musical ability? I think that approaching the problem as a question of learning to read will be the most productive perspective. I'll have to take what I know about learning to read-- as opposed to being taught to read-- and apply those principles analogously to musical perception. Last night I decided to try Chordfall again. I've been playing Interval Loader doggedly, but I hadn't used Chordfall for a long time because I know the game has an inherent flaw that prevents progress-- at later levels there is one chord which, when inverted, is identical to one of the non-inverted chords. Therefore there's a 50/50 chance of identifying that chord correctly by making an incorrect response. Back then, rather than allow myself to reach that point, I played only until Level 13 (all 12 chords in fixed-do) and stopped, expecting to fix the problem later but then deciding to replace the game with something else altogether. So last night, as I was contemplating changes for v5, I decided I would try Chordfall again just to confirm my dissatisfaction with the game mechanics; indeed, I found that there's too much gameplay in it. Unlike the other two games, I can't just put my head down and close my eyes and play just by listening. It was tedious having to place and drop all the little tiles, but as I continued to play, that annoyance was gradually overwhelmed by my surprise that I was identifying these chords without the slightest difficulty. I rocketed all the way up to Level 12 with barely a single error; I was doubly amazed because I remembered how I had before been easily and consistently confused between the minor 7th (frog) and the dominant 7th (walrus), or the minor triad (cat) and the diminished triad (duck), or the minor-major 7th (donkey) and the major 7th (monkey). I still sensed their similarities, but for some reason they all now seemed more distinct and unique than before-- there were certain characteristics of each chord which stood out distinctly, yes, but strangely now the entire character of each chord also now seemed unique. I found I was always able to recognize the half-diminished seventh (possum) not because of some specific feature (like the Mm7's twanging top tone) but because it just sounded like that. Since the only ear training I have ever done is with the Ear Training Companion, I have to conclude that Interval Loader and Absolute Pitch Blaster are what changed my ability to perceive-- and changed my unconscious strategy for recognizing-- these chords. With the introduction of the least familiar chord at level 12 (the suspended 7th) I made enough mistakes to end the game, and I became curious to know when I had played last. 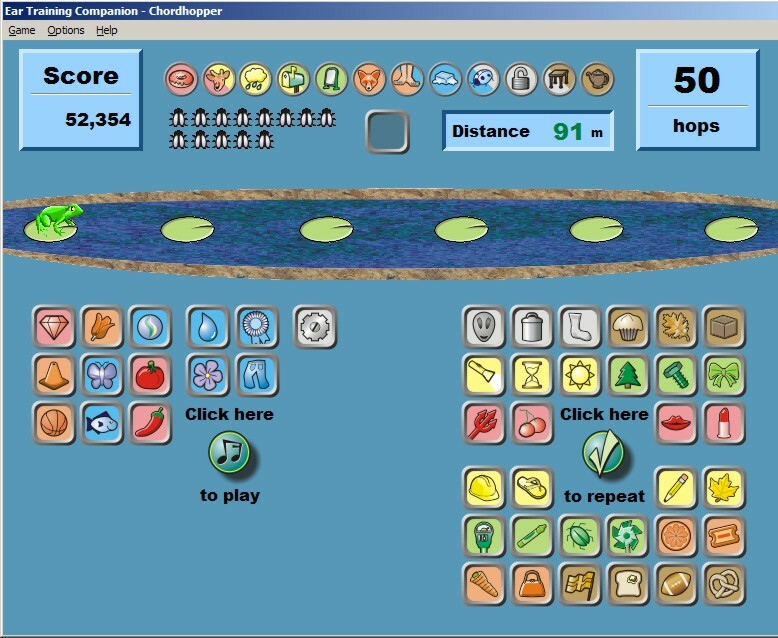 I looked at the high score table and saw... April, 2005. More than a year! In more than a year, without any practice at all, not only had I experienced no extinction of my previous Chordfall training, but thanks to Interval Loader and Absolute Pitch Blaster I had actually gotten better. I find this personally satisfying, of course, but mainly I'm pleased to have evidence that the methods I've been developing do indeed accomplish what they intend-- to cultivate, and permanently alter, a fundamental perception of musical sound. I occasionally get a complaint that the Ear Training Companion games don't include the "names" of the musical sounds. My answer is the same in every case: the names aren't what you want to learn. ETC's games are designed to train your perception and comprehension of musical sound. The names of these sounds will come later, almost automatically, as a natural consequence. They have to. Once you have formulated a new concept, you need a name for it; but until that concept exists then "minor second" is as psychologically meaningful as "garbly blorf." I do need to rewrite the games so that the names are introduced eventually-- I had assumed that a musician will be exposed to the names elsewhere, and that's not necessarily true-- but the games are designed to teach music the way it is actually experienced. Recently this was put to the test. I found myself on the spot. My stepfather is a skilled clarinetist, with adequate sight-reading skill, and he was schooled in traditional ear-training methods. We found ourselves at the piano along with my mother; she played a chord to orient us both to C-major, and then began playing individual tones. I identified the pitches instantaneously-- bam! bam! bam!-- while my stepfather, startled, struggled to keep up. Yes, he was able to identify them, but only after reflection and calculation ("I need some time to count the space between"). I was intrigued by my own mental process. I'd recognize the sound instantly, and almost immediately the name of the scale degree would pop into my head automatically (e.g. "minor seventh"). Then, with some delay, I'd attach the letter name ("Ooh! That's a minor seventh.. and that's.. um... it's... oh yeah! B-flat."). At the moment I can only do this for C-major, and since I can recall a middle C almost flawlessly (it becomes a B when I'm tired) I could probably produce identical results to P.T. Brady's 1970 study. Currently I am (at last!) practicing single-tone movable-do in Interval Loader, so it won't matter which key I'm oriented to, and if my skill in movable-do advances to the same level as what I can do in C-major then that ability will essentially be indistinguishable from absolute pitch to any observer. The mental process-- the characteristic of the tone which is isolated and identified-- is of course completely different from true absolute pitch... but only I would know it. And unless I knew that this wasn't really absolute pitch, I would think that I did have absolute pitch. A girl with exactly this skill told me, back in 2003, that she had perfect pitch, and then when I questioned her further she acknowledged she had actually been trained in Kodaly solfege, but she figured her skill might as well be absolute pitch. Regardless of the field of inquiry, the critical action is to examine a method and ask, what is really being learned? Then, on the flip side, what knowledge am I really teaching, which leads to the most important question: how is the desired knowledge actually learned? An essential assumption which I have not previously mentioned is that acquisition of knowledge is functionally equivalent to application of knowledge. If true learning is accomplished by active problem-solving, then you can determine the learning process by deconstructing the problem, and subsequently you may encourage learning by creating identical problems to be solved. I would argue that the effectiveness of a teacher is not in their ability to transmit information, but in their ability to construct meaningful problems. Unfortunately, even teachers who understand this concept do not understand how to apply it. Having deconstructed the original problem, they don't create new problems but instead assemble a "curriculum"-- a series of tasks which had comprised one successful solution. Since this is evidently "how it's done", they presume that by sending all students through this same process the same knowledge should be acquired. However (as anyone who has ever done a chemistry lab will undoubtedly attest) the students of this curriculum merely learn to accomplish the tasks. If any greater knowledge is abstracted from the process, it is happenstance-- and typically it does not happen, as students are "graded" on their uniformity in accomplishing the tasks as prescribed and not on their abstracted knowledge. Knowledge is induced by solving a problem, not by reception of information or execution of assigned tasks. However, to solve any problem it is immensely helpful to know what the tasks could be, and what information may be relevant to receive, so that an instructor can offer meaningful suggestions and guidance to facilitate the problem-solving process. So how do people naturally learn absolute pitch? Very few studies attempt to examine how absolute pitch develops-- with good reason. It's an inherent contradiction: how do you study the development of something that remains undetectable until it's already fully developed? Studies of young children typically attempt to prove the potential to learn. Studies of older children (and adults) analyze the effects of the already-existing skill. Almost everything is either before and after, never during. Miyazaki's recent piece (2005) does look at that stretch of time in between, following children who appear to develop the ability during the course of the study, and it seems to be the best report to date-- both in its highly detailed description of the training method and the identification of specific procedural factors which contributed to the variable levels of success for different children-- but it is nonetheless beyond the scope of his paper to analyze why that method could have been successful in the first place. A similar method implemented at a non-Japanese school for the same length of time (Cohen & Baird, 1990) produced no significant absolute learning in any of its subjects. Those authors pointed to possible conditions which may have caused failure, but there was no test of those conditions, so it's equally possible that their non-Japanese subject pool was genetically unresponsive to musical training. All we know for sure from these two studies is that, given similar musical tasks, one (Japanese) population acquired absolute pitch and another (Canadian) population did not. Subjects were trained individually three times a week for approximately 5 to 10 minutes each session... [but] In Japan, the training was conducted... every day: one day a week by the music teacher at a music lesson and six days a week by the mother at home. ...In Japan, the children were required to name the notes (pictographs) on each flag... in the present study, the children simply raised the flag. Finally, and perhaps most importantly, the Japanese children were taking piano lessons which were coordinated with this training program... the Canadian children were not yet involved in music performance lessons. - It is decided that a student will "learn music"
As you might remember from your own experience, children often learn from this scenario that "piano practice" is something they have to do to keep their parents from getting upset. I too distinctly recall the feeling of relief when the minute hand hit that half-hour mark at which I gratefully slid off the bench. But even when a child actually enjoys the lessons and practice, I believe our cultural bias does considerable harm to that child's potential by impressing upon them the idea that music lessons and music "practice" is something separate from everyday life, something you have to stop and do. It doesn't really matter that the Japanese and Canadian students did different levels of training. No study has yet asked why those particular tasks were included or what problem those tasks were created to solve. Indeed, no study attempts to determine what problem the children are solving, or to further describe the process by which the children are solving the unknown problem. Every study instead focuses on analyzing the series of teacher-imposed tasks and their quantitative results-- not the students' behavior, nor attitude, nor understanding of the material. But what are the students really doing? What do the children think they're doing? What are the students really learning? I've found an answer in a somewhat unexpected place. Over the past three months I've been translating more of the early German articles-- the ones which weren't printed in that nigh-illegible funky Fraktur font-- and as I began one I was encouraged by its title, The contribution of absolute pitch research to compulsory preschool training. As I began the translation I was first annoyed and frustrated to discover that it was not a "scientific" article at all, having no quantitative aggregate data but only subjective observations of a single child. Gradually, as I continued to translate, it dawned on me that this was why the report is unique; it is a report of a child who developed absolute pitch, but its observations were taken during the time which the development occurred. As is typical, the subject ("A.R.") only came to the researcher's attention after the skill had already developed, so it is the mother who must be thanked for her detailed notes and her ability to communicate them to the researcher. There are two completely different ways to read this article. In one perspective, you can see A.R. 's anecdotal accomplishments and say "he could do this because he was born with absolute pitch." In another perspective, you can look at the same events and see them not as demonstrations, but as trials, and say "this was how he taught himself absolute pitch." The latter perspective deepens when you consider the possibility that A.R. 's mother recorded only the successful trials, ignoring the unsuccessful trials which would be no less instructive to A.R.-- but you don't need to make that assumption to imagine that what she observed were still the types of activity which lead to successful acquisition of the ability, and if you imagine that A.R. was solving problems rather than demonstrating skills you might begin to infer the processes he underwent. I believe the crux of the matter is revealed in the article's simple summation: "For him, the world is full of sounds." This is not normal. In our culture, all language sounds are literal symbols, and all non-language sounds are functionally descriptive events (such as "mosquito buzz"). If we attend to sounds musically at all, we habitually compartmentalize that experience into "music lessons" and "music practice" and thus fail in other contexts to recognize or acknowledge or even think about those same qualities of (or purposes for) sound. Even when we "take music lessons", we rarely enliven our musical experience and awareness, but instead memorize prescribed sequences of tones which we reproduce by rote, and we evaluate our progress on our ability to produce nice sounds rather than our ability to think musically. In other words: ordinarily, when we listen, music is music and words are words and everything else is a sound effect. Ordinarily, when we make music, we do precisely what we are directed to and leave "improvisation" or "composition" to the experts. But for A.R., any sound he hears has its musical qualities, and creating original music is as natural to him as speaking. I believe that this bias is what prevented the Canadian students from learning absolute pitch. Although at the end the Canadian researchers acknowledged that their group had received a different level of training than the Japanese children, their cultural bias is what allowed the difference in training to occur. The Canadian researchers approached and applied the absolute pitch training as though it were ordinary "music lessons" instead of an ongoing perceptual and linguistic development. The Canadian researchers say as an afterthought that the Japanese children had an advantage in their training because of their daily practice and integrated piano lessons-- but if the Canadians had understood at the start the nature of the training they would have realized the necessity of daily training for its constant perceptual and cognitive reinforcement, and they would have realized the necessity of the piano lessons to give meaning, structure, and purpose to the absolute training. The Canadian researchers did not realize that musical training is a whole-language activity; the Japanese did. The Canadians did not provide their students with the supporting "non-absolute" activities which are part of the overall training; the Japanese did. The Canadians did not learn absolute pitch; the Japanese did. Perhaps a parent may overcome the bias as easily as allowing music to exist everywhere, bringing music into their children's lives as they already know how to do with language or other "natural" skills. Is there a parent who does not, every single day, encourage a child to recognize and name the things they see? I still remember that moment three years ago when I saw a man at the post office hold out a customs form to his little daughter and say "What color is that? What color? That's green, isn't it? Green," and encourage her to repeat the word; I guarantee you that it would never occur to this same man to rap his fist against the mailbox outside and ask "What pitch is that? What pitch?" Of course this is not a good method of teaching, but obviously this parent is constantly thinking of ways to bring language and color into his child's life, and he knows these can be found anywhere in the world. He knows that this will help his child understand and explore her world. But ask this same man to teach his child music, and he'll shut her up in a "piano room" for half an hour every day. He knows that music has nothing to do with the everyday world. A parent should recognize that the process of training music is an ongoing suffusion of music into their child's life, not the systematic evisceration of music from life by its segregation and entrapment into "lessons" and "practice". The goal of musical training is not to assist regurgitation of memorized and rehearsed prescriptions, but to enable discovery of musical perception and freedom of musical expression. As I see it, this is the primary obstacle to introducing the We Hear and Play curriculum into the non-Asian culture: educating parents to know the difference. The number one question I receive is "how long do I have to do this each day?" and the number two question is "how long will it take"? The answer is not a discrete span; many tiny opportunities can be taken at any moment to encourage a child's musical development. The method's piano training and ear training are the structured guidance which provide specific forward direction, but they are nonetheless meant to be guides to be drawn from mindfully, not formulae to be adhered to slavishly. The real "method" exists in the parent's willingness to encourage their child to live musically. This is also why I am continuing to develop the Ear Training Companion for adults. I was recently asked, by someone who had not read this website nor examined any related training systems, what makes ETC's absolute pitch training different from all the other methods available? The difference, I replied, is that ETC can be used by anyone. ETC teaches musical perception, where other methods enhance musical perception. As the most obvious example, both Rush (1989) and Nering (1991) demonstrated that success in a certain training method was highly correlated to existing musical ability; Rush stated outright that his data showed how each subject's level of existing musical skill dictated their ability to even attempt the exercises. By contrast, from the available reports for the Ear Training Companion, it appears as though anyone of any musical skill will learn what it teaches; one's existing musical skill determines not how far you'll get, but how fast you'll get there. Even so, what fails to distinguish the Ear Training Companion from other methods is where "there" is. A number of months ago I realized that the end goal of every method, regardless of its approach, is the same: to name and recall the 12 tones of the musical scale. Even if ETC's absolute pitch training were indeed more effective than any other method that ever existed, what it currently promises to deliver via that method is still nothing more than has been repeatedly attempted for the last 107 years. And nobody really needs to name notes. If you teach someone note-naming and say "You now have absolute pitch!" I consider that equivalent to teaching someone to recognize and say all the Chinese letters and telling them "You now know Chinese!" What the Canadian/Japanese studies show for children is true for adults: absolute pitch training must be made a component of an overall musical education. As Keni'chi Miyazaki puts it, "training designed solely for developing [absolute pitch] may not only be ineffective but even musically meaningless." So as I continue to develop this method, my goal is to further integrate absolute pitch with other musical skills, and this should principally accomplish two things. One, total novices should become able to proceed more quickly; if musical skill determines how fast you'll learn absolute pitch, then boosting overall musical skill will increase a novice's rate of progress. Two, I expect that people will stop wondering what the point of absolute pitch actually is as they find themselves using it in their everyday experience of music. This leads me to tell you where I'm going to be this fall. Unless something happens to prevent it, come October I will be found at the psychology department of Indiana University, working with Robert Goldstone as a part-time research associate. He's got some experiments on absolute pitch he wants to conduct in his "Percepts and Concepts" lab, which my knowledge will greatly inform; his expertise in perception and concept formation will undoubtedly help me understand how to further refine and develop my approach to absolute pitch training. It's an exciting prospect, knowing that I may begin contributing to the official scientific literature of absolute pitch, so here's hoping it all works out. In the meantime, in these last few months, I haven't been completely idle with this site. I've translated more German articles (posted in the bibliography) and also posted Lilli Lehmann's How to Sing, which is awesome-- the progress I've made in the last two weeks in my singing technique, just from the first few chapters, is astounding. Where ETC may have enabled me to sing the correct pitches for tonight's audition, this book made it possible for me to sing them well. And yes, I did get the part. Throughout the month of September I will be playing "Bellomy" in The Fantasticks at the Village Players Theater in Oak Park. The main reason for the recent delay is that I am, finally, done with the University of Florida and out of Gainesville. I'm in Chicago, working for the summer at a voiceover studio, learning the ins and outs of this particular business and, when possible, exploiting my access to its equipment. Specifically, I've begun recording some of the works of Edgar Allan Poe, for which my voice and temperament seem particularly well-suited. Give them a listen. I hope you'll enjoy them. John Taylor Gatto has published the entire text of The Underground History of American Education on-line, for free. Although his stated subject is compulsory schooling, I'd encourage anyone to read it just to make themselves look differently at the world around them. An analogy will illustrate just how radical this trust really is. What if I proposed that we hand three sticks of dynamite and a detonator to anyone who asked for them. All an applicant would need is money to pay for the explosives. You’d have to be an idiot to agree with my plan-- at least based on the assumptions you picked up in school about human nature and human competence. And yet gasoline, a spectacularly mischievous explosive, dangerously unstable and with the intriguing characteristic as an assault weapon that it can flow under locked doors and saturate bulletproof clothing, is available to anyone with a container. Five gallons of gasoline have the destructive power of a stick of dynamite. The average tank holds fifteen gallons, yet no background check is necessary for dispenser or dispensee. As long as gasoline is freely available, gun control is beside the point. Push on. Why do we allow access to a portable substance capable of incinerating houses, torching crowded theaters, or even turning skyscrapers into infernos? We haven’t even considered the battering ram aspect of cars-- why are novice operators allowed to command a ton of metal capable of hurtling through school crossings at up to two hundred miles a minute? Why do we give the power of life and death this way to everyone? It should strike you at once that our unstated official assumptions about human nature are dead wrong. Nearly all people are competent and responsible; universal motoring proves that. His point becomes even more interesting when you compare it to what you yourself already know, such as the fact that lawn darts have been completely banned in the United States-- illegal not only to manufacture but even to sell second-hand-- because they caused a grand total of four deaths. Statistically, cars have already killed more people than that since you started reading this article. Gatto is also not wrong to suggest that people get to drive because our economy relies on it; in 2000, I met a physically disabled student who (when I asked why he was depressed) explained to me how, since he'd failed his driving test the previous day, California law disallowed him from ever having a driver's license in the future. This had been his one and only chance, he said, for his entire lifetime. Despite the student's detailed explanation of the relevant and applicable laws, until I read Gatto's book I still didn't really believe that it could be true. Sakakibara (2004): "There is a critical period for the acquistion of absolute pitch. Although [absolute pitch] can be achieved through appropriate training, it has been observed that children over the age of 6 find it difficult to acquire absolute pitch." Levitin (2003): "The real mystery is why it is that some children develop [absolute pitch] and others do not." ...consider the intellectual component of driving. It isn’t all just hand-eye-foot coordination. First-time drivers make dozens, no, hundreds, of continuous hypotheses, plans, computations, and fine-tuned judgments every day they drive. They do this skillfully, without being graded, because if they don’t, organic provision exists in the motoring universe to punish them. There isn’t any court of appeal from your own stupidity on the road. What Gatto implies, but doesn't say: a relevant skill is quickly and easily learned, regardless of its complexity. Learning an irrelevant skill is arduous and tedious, regardless of its simplicity. Trying to learn something that is both irrelevant and complex is, therefore, extremely improbable, to the point of seeming impossible. Something like... oh, say, learning perfect pitch. Their method is mind-bogglingly simple and, contrary to Cohen & Baird's speculation, requires no additional musical training. In fact, one of the criteria of inclusion for Sakakibara's 2004 subjects was that they must not be taking any kind of additional musical training, to ensure that the results achieved could be attributable solely and exclusively to Eguchi's method. Eguchi's method is not a comprehensive system of musical training like the Taneda work, nor is it elegant-- nor is it any fun, really, and it's not designed to be-- but for teaching perfect pitch, like teaching a child the alphabet by rote, it gets the job done. Although Taneda's system should, I think, be used for those parents who want their children to most fully experience music, Eguchi's system is so simple and objective that any parent could use it with little effort or training. A child is trained to memorize and identify nine different chords. When the child has successfully memorized all nine chords, they will have acquired absolute pitch. Sounds bizarre, yes? And yet it makes perfect sense. I was terribly amused when I recognized that I'd invented practically the same system years ago, myself, without realizing it-- that was "Chordsweeper", and indeed, when I played that game I got the same results as Eguchi's method. More on that later; first, the details. The entire system is nothing more than playing chord after chord for a child to identify. This same repetition is done 4-5 times a day, with 20-30 chords in each session and no variation, for a total of 100-150 chords a day. What makes the system clever is the order in which she introduces the chords, and the rules she imposes for their systematic introduction into practice. There are, in total, more than nine chords, but the first nine are the most important. If you hadn't noticed at a glance, these nine chords encompass all seven of the piano's "white key" sounds. And I know from my own experience that Eguchi's assertion is true: by listening to chords, a person's mind automatically begins to pull out the individual pitches. If you don't feel like reading that entire article right now, here's the meat of it: "After playing [Chordsweeper] for a short while, I began to hear a single tone "ring out" from each chord. Soon I was able to identify a V-chord because of its re-ti feature. Eventually, gradually, I was able to separate the individual tones from every chord I heard." Eguchi forbids practice with single tones, which I believe is an unnecessary caution. She says that single tones encourage relative listening and should be avoided. She explains: chords have approximately the same "height", and will therefore discourage evaluation along a relative spectrum; but the most obvious characteristic of single tones is the separation of height between them. I don't agree with this. The research I've seen, and every music teacher I've spoken with, clearly indicates that young children do not perceive tones as "higher" or "lower" until they are trained to. The research shows that preschool-age children are indifferent to which characteristics of objects are their definitive traits, and therefore Eguchi's assertion that height is "more obvious" is only true of an older listener who has learned to judge height as the prime criterion. This is precisely what Eguchi describes should happen, and why she has selected those nine chords in that particular order. You can see how the first few four chords alone could compel a listener to recognize C as the sole shared component between chords 1, 2, and 4; G, shared between 1 and 3; and F, shared between 2 and 4. The pitches are further distinguished and differentiated through the inversion of chords, such that CEG and EGC share "C" chroma but in multiple octaves. Through persistent repetition, a child's mind will abstract the individual pitches so that, by the ninth chord, they will be thoroughly familiar with all seven pitches of the C-major scale (the "white key" sounds) across 5-6 octaves. Eguchi refers to this as "building the chroma template" and her 1982 study shows the successful results of single-pitch identification tests performed after 6 and 9 chords had been memorized without any specific training for individual pitches. None of the three papers say specifically how the children are trained to know the names of the pitches, if indeed they are so trained. Throughout the training the chords are to be named only by color, not pitch (again, the ordinal sequence of letters is presumed to indirectly encourage "height" comparisons), it's not specified in the 1982 paper how the pitch tests were conducted, and the 1999 and 2004 followups only test for chord recognition, not pitch. I initially wondered if perhaps each chord would correspond to a specific pitch, and a child would thusly suddenly discover themselves to already know the pitch names, but of course there is no chord among the nine which has only one distinct pitch unshared by other chords. Although the 1982 paper presents and explains the results of actual single-pitch testing, the subsequent 1999 and 2004 reports purport only to demonstrate that children learn to make chord identifications from a chroma strategy, and imply that the systematic development of this strategy is the critical training goal which allows single-pitch identities to become distinct in memory. Failing this training goal, perfect pitch will not be achieved. And that's what happened with Cohen & Baird (1990). Once I had translated these three papers and become familiar with Eguchi's method, I soon remembered Cohen & Baird's experiment, and I wondered why it had failed. Cohen & Baird had strongly suggested that the primary reason for failure ("Finally, and perhaps most importantly") was that Japanese children also underwent piano training, and until now I had tacitly accepted this explanation as true. However, as Sakakibara's 2004 study specifically disallows external musical training of any kind (and yet still shows complete success), there had to be another reason. I re-read Cohen & Baird's publication, and I found to my surprise that they failed because they didn't actually follow Eguchi's method. Eguchi: practice 4-5 times a day, 7 days a week, 2-3 minutes per session (700-1000 chords per week). C&B: practice 1 time a day, 3 days a week, 5-10 minutes per session (60 chords a week). Eguchi: Each new chord is trained for two weeks, or until identification reaches 100%, whichever comes last. C&B: Each new chord was trained for five days, or until identification reached 80%, whichever came first. Eguchi: A child identifies each chord by a single color name. C&B: Each flag featured mnemonic pictographs, such that the CEG flag had on it a Cat, an Elephant, and a Ghost. Eguchi: A child is trained with the nine training chords in sequential order. C&B: random "incorrect triads" are included, which are dissonant and do not share any pitches with the training chords. Eguchi: Chords are to be learned as absolute sounds. C&B: Each training chord was transposed to five different octaves. Twenty-one chords... were played over five octaves and in random order. The subjects were to wave the yellow, orange, or green flag. This task was conducted for only two trial days because of time constraints. So there's really only one reason for the researchers' failure: they didn't follow the method. It's not because of additional piano lessons, it's not because they used an electronic keyboard, it's not because the Japanese have some genetic advantage, it's not for any other possible reason. They just didn't do it right. Yes, of course, any of these other reasons could end up being true-- if the method were to be followed correctly and still fail. But not until. Have you yet read the old article about Chordsweeper I linked to above? You may want to check it out now, because anecdotally it describes precisely what Sakakibara speculates about in both studies: the chord method won't work for adults because we listen efficiently, and for an adult, relative listening is the more efficient strategy. By the conclusion of Sakakibara's second study, Sakakibara shows that the more successful subjects made "chroma errors" (confusing chords with identical pitch components) while the less successful subjects, the older subjects, made "height errors" (confusing adjacent chords). Sure enough, the whole reason I wrote that entry back in 2004 was because I realized that all the errors I was making were semitone errors-- following exactly Sakakibara's description of "height error". In 2004 I wanted to believe that I was making absolute judgments that were simply "one away", but looking now at my description of how I identified the chords, I see that I was indeed exhibiting precisely the relative strategy which Sakakibara points to as the indicator of the method's failure with older subjects. However, it is only an indicator. In playing Chordsweeper, I didn't gain perfect pitch, no, but I gained the same awareness of individual tones that the Eguchi training is meant to induce. Sakakibara and Eguchi both explain that an adult (or older child) cannot form the "chroma template" from the Eguchi method, but they believe the reason for this is that the adults are unable to abandon their relative strategy. I suspect, more likely, that the issue is the same which drove the development of Absolute Pitch Blaster-- adults are no longer perceptually naive, and are therefore incapable of perceiving chroma as a unique quality. I've been wondering for many months now what I could create to replace Chordfall which would at once be an effective chord trainer and somehow-- I didn't know just how-- would directly contribute to absolute pitch perception. Little did I know that I'd already created it! If I still have the old code somewhere (fingers are crossed) I should be able to reconfigure the game to follow Eguchi's chord order (it already follows the same basic rules!) and perhaps the Absolute Pitch Blaster training will allow the "chroma template" to be formed from the pitches extracted in Chordsweeper. Perhaps not, of course, but it's worth a shot. 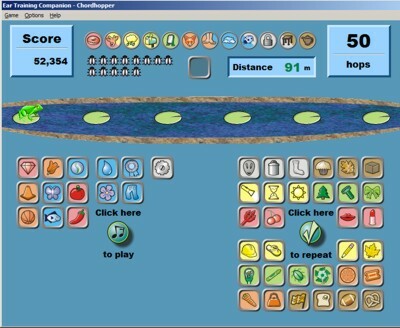 I had said in the forum that I'd hoped to develop new games that could be played by listening only, without looking at the screen, but I remember being persistently addicted to Chordsweeper so I don't think I'll mind its resurrection. How do Eguchi's students learn the names of the pitches? There's nothing in the Japanese articles which answers this question. In the 1982 report, Eguchi explicitly and vehemently says that children are not to be trained with single pitches at any time. Only the chords are taught, and even then the chords must be referred to by color, not by musical names. And yet, after only six chords, she conducts a test in pitch naming for all 12 tones. She conducts a second pitch-naming test after 9 chords, and not only are the children accurately naming tones, but they are identifying some "black key" tones as well. By name. It would seem there's some part of the training she's omitting. But Sakakibara says that the Eguchi method described is the complete method. Sakakibara's subjects were selected because they were receiving no additional musical training, and the subjects all achieved absolute pitch. Or... did they? Unlike the 1982 study, Sakakibara does not conduct tone-identification tests to demonstrate that the children have acquired the ability. Instead, Sakakibara shows that the children have stopped making "height errors" and are now making "chroma errors" in their identification of chords; that is, the children recognize as identical chords which have the same pitch components, rather than chords which are adjacent on the keyboard; this effect, rather than pitch identification testing, is the result that Sakakibara uses to conclude that the children have acquired absolute pitch. This may be a valid inference-- that children who identify chords by their chroma will also identify pitches by their chroma-- and the chord training would indeed cause anyone to hear the pitches within the chords as distinct and separable phenomena, but there's still nothing to describe how the children learn the names of the pitch categories. Where does it come from? When a single pitch [e.g., do] is heard among neighboring pitches [e.g., re mi fa], and there are no clues [i.e., chords] to help identify that pitch, it is much more difficult to distinguish it from the other pitches [implication: fixed do training alone is insufficient]. Therefore, we adopted the method of forming associations ("grouped correspondence") between the chords and their [solfege] names, thus making each chord a clue to the identification of pitch [and thereby solidifying fixed-do training with supplemental and substantive stimulus]. A great deal of time is required to form the internal pitch template; if there are fewer clues available to interpret the musical sound stimuli [i.e., if fixed do is used alone], still more time and effort will be necessary. A chord provides a [supplemental and] substantial stimulus that can be easily comprehended, making it easier to differentiate pitches [than when fixed do alone is used]; it [i.e., chords] helps, rather than hinders [fixed do training], because a young child's tendency toward relative listening is not yet strong. The chord's targeted component, that is, the [fixed do] pitch with which it is associated, can be presented by itself throughout the training, and gradually it will be differentiated from the group as an element of that group. While Josh was puzzling that out, I was digging through the boxes I'd shipped from Florida, and sure enough, three of the six Japanese-language books turned out to be the books of the Eguchi method (I felt like Dorothy who'd been wearing the silver slippers all along!). Thumbing through the books revealed the following illustration, which is immediately reminiscent of Kodaly's solfege hand signs. On a nearby page, I also found an illustration which answered a confusion I'd had about the Cohen and Baird experiment. The authors made many methodically destructive decisions based on their time limitations, but they nonetheless claimed to be in correspondence with Mrs. Eguchi herself; if that were so, I wondered, then why would they have placed little pictographs on each flag? In the 1982 paper, the flags were described as only a solid color, and only the color names were spoken; so why did Cohen and Baird believe-- based on their conversations with the originator of the method-- that a red flag should have on it little pictures of a Cat, an Elephant, and a Ghost (to represent the CEG chord)? The illustration offers a clue. Using pictographs to represent the scale degrees is another Kodaly concept. As you can see from the Japanese version, the mnemonics are to the solfege syllables, not the letter names; the single character beneath each picture is the Japanese symbol for do, re, etc, and you can see how they (mostly) match the first sound of the objects' names. So Cohen and Baird were following what they thought were Eguchi's instructions, but they got this wrong too. The pictures are only meaningful when the children are learning fixed-do simultaneously with the Eguchi chord training. If Cohen and Baird were going to use pictures to reinforce the pitch names, instead of using a Cat, Elephant, and Ghost, they should have used a doughnut, a meatball, and a soldier. Eguchi's are syllabic mnemonics, not letter mnemonics. This is not a minor point. Research has shown that letters and syllables are processed differently in the brain, but you can even see it from simple common sense. If a picture of an elephant is used, a child must first have a mental representation of the word spelled "elephant" to abstract the written letter "E", and to pronounce that letter differently from the "eh" which begins "elephant"; then, if a child successfully makes that abstraction, they must be further trained to realize that that abstraction was why the picture was used, and then to associate that abstraction with a musical tone. However, if a meatball is used for mi, then by speaking "meatball" out loud a child is naturally reinforcing the solfege name. All they have to do is drop the extra syllable(s), and they've already learned the name of each tone, as the name of the tone, just by speaking the name of a familiar object. It would still seem a bit baffling why Eguchi would so vigorously deny relative listening. She takes it to the point of refusing to use alphabetical letter names in case a child starts to infer pitch relationships from the letters' ordinal position in the alphabet-- yet she obviously teaches scale degrees, which is a core component of "relative pitch" skill. If I translated more of her book, I'd probably discover why she feels this apparent contradiction can be reconciled; but since my own research provides an answer (i.e. "height" judgment is a judgment of timbre, not spectral frequency) I don't really need to know what her speculation might be. Suffice to say that, in absolute pitch training for children, the pitch names are initially named by fixed-do solfege. ETC v5 is ready to roll. If you've bought the program at any time in the past, please e-mail me for an upgrade. If you haven't got ETC yet, now's a fine time for it. The Eguchi system succeeds despite the way it's taught. The teaching process is extremely simple. All a parent needs to do is drag their child to the piano every day, just a couple times, for only a few minutes, and conduct a simple drill. Every session is exactly the same, and a student's progress is objectively tracked with relentless testing. There is no room for creativity. Under such a simple and stringent procedure, anybody can do it. Teachers and parents will undoubtedly find the system comfortable and familiar. Parents-- especially "non-musical" parents-- are probably relieved to be given explicit and rigid instructions and know exactly what to do. It doesn't matter how disinterested the child may be, or how unenjoyable the session, as long as it gets done. Teachers don't actually have to know anything about music or musical development; they simply have to read the parents' tracking sheets each week and confirm that the training is proceeding as dictated. Furthermore, both teachers and parents will feel relieved that, for them, there is no danger of failure. All they need to do is play chords and mark responses. Naturally, this puts terrific pressure on a child. In this training, the child is the only one who can fail. Teachers and parents have all the answers, none of which are given to the child. The child has to guess every time, and each incorrect guess is immediately identified as renewed failure. The following graph (from Sakakibara 1999) shows what effect this can have. The white parts of each cylinder represent correct answers, and you can see how at 40 weeks ("period 20"), the first four chords are identified with near-perfect accuracy. By the 46th week, the CEG chord-- the first and most familiar chord-- is a pronounced failure, and by week 50 all eight chords have become a jumble. Sakakibara explains how CEG could be so consistently mistaken: "Because SR [the subject] has been corrected so many times with DGB ('no, that's CEG'), he now frequently identifies CEG as DGB instead." In other words, "SR" has stopped trusting his own perceptual judgments and is instead trying to follow what the adults tell him. Even so, after this 10-week slide and a subsequent 12-week recovery, "SR" did get past this problem and successfully complete the training-- and this is what I mean when I say that the system works despite how it's taught. It is inefficient, but by dogged and forced repetition the answers do emerge. We've been trying for years to get them decent music lessons, but we can't find an instructor who isn't a cartoon caricature of a piano teacher. This last time, I took my younger son to a teacher who had been highly recommended by a friend. My son sat down at the piano while the teacher was busy preparing her books; when he hesitantly pressed a few keys, the teacher looked at him disapprovingly over her glasses; and when he reached forward to play a short gliss, she barked at him to get his hands off the instrument. Obviously, we never went back. Q: What do I do if my child cannot focus? A: Put away all interesting things to create an environment where concentration may occur. I couldn't help but read this as "You're not leaving that table until you finish your broccoli!" If the chord training is the only thing available to do, perhaps a child will comply out of sheer boredom; or, perhaps, I can see how this could slide into a child's perception of chord training as a punishment, because they're denied any interesting toys until they've endured another session of chord-naming. A: It is recommended to have toys, paper and crayons, and picture books in the instruction room. It is also good if the child brings one or more of his or her own special games, which helps inform the teacher of the child’s particular interests. The game material provided by the teacher has two important functions. First, toys are familiar to every child, and enables them to feel at home in the instruction room. Secondly, if the child is not able to cooperate with the piano instruction for whatever reasons, there is always the possibility of using an instructional toy to play with the child. Because the Taneda system is focused on broad principles, rather than rigid procedures, there are many different ways to engage a child to successfully teach and learn. With the Eguchi system, there's only one right way, and a reluctant child must be coerced-- lovingly or otherwise-- into doing it. And yet the system does work, despite the teaching method-- and it works only for 2- to 4-year-olds. I've spent the better part of the weekend trying to figure out what it means to "rotate" a sound. The problem is in the third dimension. Height, width, and length are all spatial dimensions. A musical sound has height (amplitude) and width (wavelength) which by themselves define a two-dimensional plane; but how do you get depth? I suspect this will require a sewing-machine kind of answer, where "depth" will literally emerge from a surprising angle-- because even once I considered that two intersecting planes may define a three-dimensional space, one of those planes must necessarily extend into a third dimension, and it seems obvious that sound has no spatial "width" of definitive consequence. However, even though I haven't yet solved the three-dimensional problem, I encountered an unexpected two-dimensional effect. When I brought up the problem to our musical director, he pointed out that a two-dimensional object can be rotated through two-dimensional space, around an axis. If there's any validity to this "rotation" idea, he suggested, then it should be possible to rotate a two-dimensional object and have it remain perceptibly similar. Once I got home that night, I did some quick lookups to determine the measure of amplitude; I was relieved to see that amplitude, like frequency, is perceived logarithmically (not arithmetically), and so in short order I created this sound file. What you're listening to there is a sound which slides from 440Hz to 880Hz... and drops 50% in amplitude. I listened to this thing over and over on my best headphones and I could not convince myself that this sound ended up only half as loud as it started. I wondered if it was an illusion of the "rising" pitch, so I reversed the wave, and it still sounded the same... or, if anything, it sounded like the volume decreased instead of doubled. Could it be that the difference was too narrow to be noticeable? I tried again, sliding this time between 220Hz and 1760Hz and an 800% difference from front to back; but I got the same effect. This time, I could hear a thinning out of the sound as it approached the end, but that was easily interpreted as a loss of robustness rather than a drop in volume, and in any case it certainly didn't sound like only 12.5% of the original loudness, even though I could see on the screen that this was the case. I don't think this qualifies as rotation. If a loud low sound were turned on its side, it would become another long wavelength with a high amplitude, not a short wavelength with a low amplitude. If the length and width of an object are increased or decreased in proportion to each other, then an object seems instead to be moving closer or further away-- while it stays the same size. Certainly you can listen to the two sound files above and imagine an object rising away from you or falling toward you; and if you allow yourself to imagine the third of these three images as a drawing in perspective, you'll see that it does create the illusion of a consistent-length line at different distances. I haven't yet figured out how to manipulate my sound editor to create the same illusion with reversed dimension-- that is, to make pitch chroma appear to stay the same while loudness perceptibly increases or decreases. But maybe that's not how the illusion works; after all, I can't make a line appear to be further or nearer without changing its apparent size (or interposing new objects). I don't know if I'm going to continue to pursue this question vigorously, if at all, but it captures my interest because it seems that rotation would be a more natural way to learn about objects, whether visual or aural. When you want to learn about a thing, you pick it up, turn it around, examine it from all angles; the object persists throughout every transformation. It's common sense to examine a new object this way. The research shows that active rotation is superior to passive observation. Yet when attempting to learn musical sounds such as chords and intervals, we only allow ourselves one "view" of each object. Inversions and other rearrangements of chords are probably not perceived as rotations, because the object does not persist. Imagine yourself sitting at a computer with a trackball, and there is an object on the screen. Moving the trackball will rotate the object along X, Y, and Z dimensions. It's easy to picture how this would affect a visual object on screen; but what would happen to a chord? What are the X, Y, and Z dimensions of a chord which would change and distort in response to the trackball, and yet retain the chord's essential identity? You can't pick up a chord like an alphabet block and turn it over in your hand. But if you could, somehow, actively "rotate" and examine a chord, perhaps the chord would become easier to recognize in any other transformation. The problem of chord rotation seems to have been solved. By whatever bizarre coincidence, yesterday I attended a brief talk which just happened to be about analyzing dimensions of objects. The presenter showed the significance of a "psychological dimension", explained the difference between "separable" and "integral" dimensions, offered a practical definition of "dimension", and showed how to identify a valid non-spatial dimension. I'm sure that these concepts will find their way into these pages in many different places-- and between this information, comments from the forum, and the idea of infinite height, I've figured out at least one way to legitimately rotate a chord. "Infinite height" is a new idea from Patterson and Griffiths which I believe effectively replaces the pitch helix. The idea of two-dimensional pitch arose in 1913 when Geza Revesz asserted that pitch was composed both of height and chroma. This assertion initially had its detractors, who scoffed at "chroma" and retorted that pitch was a measurement of height alone; however, since Shepard (1969) the two-dimensional model has been the standard, where the musical scale can be represented as a helix. But common sense should tell you this model can't be accurate. If this is a two-dimensional model, then how is chroma represented as a dimension? There's an axis to represent height (the vertical line in the middle); where's the "chroma" axis? Maybe the "axis" is the circle at the bottom, but how can it or the vertical line be axes when you can't move along either one without changing your position on the other? You can't change the height without changing the chroma. That is, changing the height is changing the chroma, which makes chroma fully dependent on height. If height and chroma are separate and independent qualities, then this model can't possibly be accurate. The pitch helix claims to represent two-dimensional pitch; but if chroma is dependent on height, then this supposed helix is actually a one-dimensional model. The twisting helix is merely a tricky way to represent the fact that certain heights fall into the same pitch categories as each other. The helix does not represent two independent dimensions of pitch. And what's that blue line doing there? The person who made this diagram obviously thought it made sense to draw the line, and you probably didn't give it a second thought yourself. But this diagram is meant to represent sounds of the musical scale. You can look at any point on the helix and imagine what sound it's supposed to represent. What, then, are the sounds represented by the blue line? You could perhaps suggest that the blue line doesn't represent sounds at all, but is instead a smaller version of the symbolic "height" line which skewers the middle of the helix, so that the only way you can really get from C3 to C4 is along the red spiral-- but that would, again, be saying that chroma is dependent on height, which again invalidates the two-dimensional helix. Geometrically, the answer is simple. If chroma and height are separate and independent dimensions, where pitch is represented by a circle and height by a line, then when you put the two together you don't get a helix, but a cylinder. The line of the helix represents an idealized intersection of height and chroma in each octave, but it is not exclusive. When pitch is a cylinder, the blue line becomes a valid path. Musically, the answer is not so simple. You can play C3 and C4 on your instrument. How do you play a C3.5? This is where Patterson and Griffiths (et al) come in. They figured out a way to change a tone's height without changing its chroma. The results of their manipulations are available online. I've spent all of today cutting and pasting and amplifying and fading various overtones to see what would result. I was able to produce tones that follow the blue line-- rising in height, continuously, without changing chroma. Click the graphs to hear the sounds they represent. You may think these tones do not sound continuous-- perhaps it seems to you each octave is distinct and fixed until the next octave appears, or one octave "gets softer" while the next one "gets louder". This illusion is described by Patterson and Griffiths; because we have learned musical sounds in octave categories, we will interpret what we hear as separate octaves rather than continuous height. If you want to convince yourself of the continuity, open one of these files in your sound editor and lift out any two segments from the same octave, and you'll hear that one segment does sound higher than the other. You may even be fully aware that the two segments have the same fundamental pitch while still perceiving that one is higher than the other, as in this sample which plays C3, C3.5, C3 (taken from the first sound file above). C3.5 sounds like an octave jump-- but for comparison, here is the actual octave jump, with C3, C3.5, C3 followed by C3, C4, C3 (also from the first sound file). One way to rotate a chord, then, is to combine these three files. I don't have more examples than this because I put these files together completely by brute force (where every overtone was a separate tone which I faded and combined as necessary) and one example is enough to show the principle. If I ever find (or write, or have written) a program which can change overtones in real time with the flick of a mouse or trackball I'll explore rotation further; in the meantime, it's enough to demonstrate that the infinite height of the pitch cylinder, where "pitch" truly has two independent dimensions, is a legitimate model-- because tone "height" is a major factor in the development and application of the Eguchi system. The pitch helix contradicts itself. The helix shows that height and chroma have a fixed one-to-one relationship, such that tone height is wholly dependent on fundamental frequency; and, therefore, since the fundamental frequency is what is judged as chroma, the transitive property would dictate that height is chroma (height = f0 = chroma). This is essentially what I was getting at in the last article by suggesting that the pitch helix is in fact a one-dimensional model. But height is not chroma; the two qualities have been repeatedly and consistently shown to be separate and separable. When analyzing Eguchi's system, this creates a problem. Eguchi created her system to prevent listening for tone "height". Eguchi prohibits practice with single tones because, she says, it draws attention to "height". She denies the use of letter names to refer to the tones because the letters' order implies their "height". She uses chords so students can hear sounds that have the same apparent "height" but different chroma qualities. And her system doesn't work for adults because, she says, adults are already too strongly biased toward listening for tone "height". The basic problem is that neither chords nor tones possess a fixed "height". Where chroma is a psychological judgment of fundamental frequency, height is a psychological judgment of timbre. Those definitions are important enough that I think I'll be melodramatic about it. For some additional convincing, here's another set of tones I cooked up. The first three tones are C4, C4.5, C4, which will sound like an octave jump; the next three tones are C4.5, C5, C4.5, which will also sound like an octave jump; and finally, you hear the real octave jump of C4, C5, C4. If you listen carefully, you'll probably be able to hear the individual harmonics and (maybe) partials-- at least the first two partials, which between them are the real octave-- and perhaps you'll complain that these are what you're listening to, not the "timbre". This is precisely the dilemma I was relieved to have resolved by the definitions of "dimension" and "psychological dimension". A dimension is "any quality that can be mapped to real numbers." The dampness of a towel, perhaps, or the spiciness of a taco sauce; if a quality can be described in terms of greater or lesser, it's a legitimate dimension. A psychological dimension, then, is any quality which can be perceived as greater or lesser, even when that quality is a composite of other dimensions. The best and simplest example of a psychological dimension is "size". Although you can easily see that the squares below possess both height and width, there's no denying that they all possess "size". They are very clearly arranged from "smallest" to "biggest" along the dimension of "size". So yes, perhaps you do hear the individual partials of the sample tones-- but there's no denying that a C4.5 sounds "higher" than a C4, or that a C4.5 sounds "lower" than a C5. "Height" is a psychological dimension of aural shapes, based on our mental calculation of the relationship between the partials, in the same way that "size" is a psychological dimension of visual shapes based on our mental calculation of the relationship between length and height. [What about the height of pure tones, you may ask, which have no additional partials? I can only shrug and say that pure tones only exist in theory. If it ever does become possible for a sound to travel through the air or the liquids of the inner ear without creating harmonic vibrations, then I'll try to answer that question.] Which means that for a tone or other musical object, a "dimension" can be any unitary aggregation (such as timbre) which is uncorrelated with other identifiable dimensions (such as intensity or wavelength). Rotating a chord two-dimensionally can be accomplished by keeping the chroma fixed while changing height; rotating a chord three-dimensionally could mean freedom of movement around pitch, height, and intensity. If other dimensions could be identified then those could probably be recruited for rotation as well. you can clearly see, by matching the peaks of the simple wave to the peaks of the combination wave, that the 800+1000 combination has created a visibly evident 200Hz "beat". It's as plain as the nose on your face; why is that supposed to be mysterious? I'd suggest the more mysterious fact to be our ability to mentally separate the combined mess into the original stimuli of 800Hz and 1000Hz tones. While playing these chords on the piano I realised that BDG and ACF are only two half-step away with the same structure but they sound completely different. ACF seems to be so "low" in the range while BDG is not. And if the "height" of two adjacent chords can sound completely different, the rationale of using chords to achieve similar "height" goes right out the window. The bottom line, then: if the Eguchi method works, it must work for different reasons than the ones Eguchi gives. Back to the question, then: how does Chordhopper work? I believe the best answer arises from information theory. Whether the subject is young or old, identifications are made by reducing uncertainty. Up to five chords, the best identification strategy is unquestionably the shape of the chord. The first five chords include one regular triad, two first inversions, and two second inversions. By recognizing the chord's overall shape you either know it immediately or have eliminated all but two choices. You can then select between the remaining two because of any other apparent distinguishing characteristic (such as "darker" or "brighter", etc). Because a chord's shape provides the best information necessary for an accurate identification, there is no reason to expect that a normal person would use any other strategy. The sixth chord begins the confusion. Now there are three chords in second inversion, so recognizing a chord's shape no longer guarantees at least a 50/50 chance. Uncertainty has been increased; but with the single (uninverted) triad as a firm anchor, and the recognizable aberration of the sixth chord's C5 component, it's still fairly easy to separate the new chord as aberrant and maintain the old strategy. The seventh chord, however, kills the shape strategy. Now there are two regular triads, two first inversions, and three second inversions. No chord can be instantly identified by its shape alone. If a person is not using "height" to distinguish between their choices, chord shape alone no longer provides any certainty; but even with a "height"-aware strategy, chords 2-5 will now all seem "low" and thus can be easily mistaken for each other (and here I'm speaking from my own experience). In all three Japanese papers, every single child stalled out at either six or seven chords, and I suspect this is why. The shape detection strategy does not provide enough information for accurate judgments, and having height awareness is just as crippling as lacking it. This chart shows a new chord added every two weeks until chord seven... and then it takes twenty full weeks to reach the eighth. And these are full weeks-- thirty chords per session, five sessions a day, seven days a week. What's more, the fact that it took 19 weeks to reach chord seven does not mean that it took the student 19 weeks to learn six chords, because the method will not add new chords before two weeks' exposure to the old ones, even if the old chords are learned perfectly. Here's another student who stalled out at 5 and six chords; most likely this student was able to identify the sole regular triad, but then couldn't choose correctly between the two pairs of inversions. More information is necessary. Some other chord feature must be noticed, detected, and recruited before a student will be able to continue. By requiring a student to identify more chords than the shape strategy can handle, the method forces a student to search for some new feature and to incorporate the new feature into their strategy as definitive. George Miller assures us that "[i]t seems that by adding more dimensions... we can extend the span of absolute judgment from seven to at least 150." That new feature is pitch. It's possible that a child exits the stagnation period at the moment when they realize that they can use the pitch sounds, in conjunction with the shapes they already know, to precisely pinpoint each chord's identity. Hearing CEG in a regular triad means one chord; hearing the same sounds in first inversion means another. Once a child learns to hear and use the pitch sounds for chord identification, there is zero uncertainty and zero ambiguity-- and the task becomes supremely easy, as evidenced by the children's performance after exiting the stagnation period. 1. A student learns to identify chords by their shape. 2. Chord comparisons automatically cause a student to hear individual pitches. 3. The shape strategy becomes ineffective at 6 or 7 chords. 4. A student is thus forced to search for new identifying features. 5. Pitch is discovered to be a valid identifying characteristic. 6. Chords are identified by their absolute pitches. 7. Absolute pitch has been learned. But if the pitch-and-shape strategy is so potent, with zero uncertainty, why is there a stagnation period at all? By the time any student-- child or adult-- reaches the sixth chord, the chords will already have perceptually disassembled themselves into their component pitches. The pitches can be heard, and plainly. Why are the now-obvious and easily-heard pitch sounds not immediately recruited for chord identification? In short: Eguchi doesn't allow it. She thinks it's dangerous. Because Eguchi believes that her students are forming an internal template of memorized chords, she deliberately does not train individual pitches until (as she sees it) the entire template is formed. Only after all nine chords are perfectly recognized does she put pitch syllables on each flag; only after all nine chords are perfectly recognized does she allow the tones of each chord to be played separately. This is, I suspect, why the stagnation period exists: a student cannot identify more than seven chords without using pitch information, but the philosophy of instruction explicitly denies the use of individual pitches. The instructional method thereby seems to cause the stagnation period. Nothing in the instruction hints that pitches are important. There are ten different pitches scattered among the seven chords; even if a child recognizes that some of the pitches repeat themselves, nothing suggests a pattern, and the method even seems to discourage finding any patterns. For example, each of the nine chord-identifying flags is a completely unique color, suggesting no relationships between any of the chords. So a child who clearly hears and notices an F pitch would still not realize that that F could be used for identification (such as "ah, that must be one of these three orange flags"). To exit the stagnation period, a child must work against the instruction to create a new strategy based on the individual pitch sounds; or, perhaps, the child's "chord template" must first be greatly weakened to the point where the chords' shapes are superseded by their pitch components. I believe that a child reaches nine chords not by memorizing the nine chords of Eguchi's "chord template"; rather, they have "added a dimension to extend the span of absolute judgment" as Miller describes. I have designed Chordhopper to alleviate these specific problems, but each child in the Japanese studies did nonetheless succeed-- eventually-- through unrelenting brute force repetition. Every child, that is, in the age range of 2-4. Subjects 5 and older didn't seem able to figure it out... on their own. Why won't Eguchi's system work for anyone older than 5? We learn by solving problems, and our problem-solving strategies dictate what we will learn. In the original Eguchi system, a student is required to identify more than six chords, and this requires a strategy beyond simple memorization-- but the system gives no explicit guidance (other than its insistence that the task is possible). The system doesn't offer any suggestions how the problem should be solved, but instead keeps flogging the same information; so without additional guidance, a student will rely on their natural strategies to interpret the chord sounds. After age 5, absolute listening is not a natural strategy. The change which accompanies advancing age appears to be that the tendency to make judgments of the chroma dimension decreases, while the tendency to use the height dimension increases. The ability of absolute pitch is the ability to recognize tone chroma; therefore, if the tendency with age is away from chroma judgment and toward height judgment, this report would show that this coincides with the critical period phenomenon, that it seems AP can only be acquired at an early age. However, there are two results which should not be overlooked. One, within Sakakibara's own paper, is that the 5-year-olds did nonetheless learn all nine chords. The 5-year-olds did successfully complete the training. These next two charts represent two students, one older and one younger. The horizontal axis represents the number of weeks, and the vertical axis represents the number of chords learned. Curiously, the chart on the right-- the child who appears to have completed the training more quickly and competently-- is the older child, who did not learn absolute pitch ability. If you believe Eguchi's explanation of how the training works, Sakakibara's conclusion is acceptable. Eguchi thinks that once the nine chords are memorized, a child should be able to recognize any absolute pitch by associating the pitch with one (or more) of the memorized chords. An older child who can memorize all nine chords, but still cannot identify pitches, is therefore obviously incapable of making this association; and, because the older children frequently make "height errors" and rarely "chroma errors", it seems reasonable to conclude that the association fails because anyone 5 or older is incapable of detecting and recognizing chroma. But that can't be true. In "Finding the Special Note" (Russo et al, 2003), the trainers used a perceptual-differentiation method, and children aged 5-6 years were the only group to evidence absolute listening, as you can see from the following charts (excerpted from the same table shown in Phase 11). Children aged 3-4 mainly found the task too complex, and adults used the "height dimension" (as Eguchi defines it) to guess within major thirds, but the 5-6 year olds pegged it absolutely. It should be evident that, in the "Special Note" method, the 5-year-olds' natural strategies lead them directly to absolute listening. Perhaps the 5-year-olds are now too sophisticated to recognize the absolute sounds directly (as the younger children do), but are still too naive to maintain a global spectral orientation which would prompt them to conceptualize "areas" of sound (like the adults). The middle F appears in only the three orange chords, and each of these has a unique structure, so hearing the F means I know it. Otherwise, I listen for the middle E, which appears only in chords 1 and 6. If there is no middle F nor middle E, each of the remaining chords can be identified by detecting the position of the G-pitch within the chord structure. On top, chord 3. In the middle, chord 5. On the bottom, either chord 8 (root-position triad) or chord 9 (first-inversion triad). This strategy is complex-- but it works. I can keep using it successfully without having to learn absolute pitch. If this chord training were the only training I received, I'd never need to change. I'd just continue to use my successful strategy and possibly never learn absolute pitch, just like Sakakibara's five-year-olds. And yet... I know it would be easier with absolute pitch. Recognizing the F-chords is so simple, I would prefer to identify all the other chords as easily; unfortunately, nothing in the chord training alone helps me change. Although listening to chords helps a student to extract, notice, and recognize the individual tones of the chords, the tones are only known in their relation to the chords. For whatever developmental reason, for students 5 or older, the tones do not automatically gain their own unique identities separate from the chords. So if Eguchi works from 3-4 years, and the "Special Note" seems to work from 5-6 years, what can the rest of us do? I noticed [Chordhopper's] effect remains even if you leave the game for a while. Now, the other day I played APB... and then played Chordhopper and suddenly I heard the C sound in the first two chords! Then I started to hear other shared sounds with the two orange chords. In other words, APB training should allow an adult to progress from "that's the orange-chord pitch, so it must be F" to "that's an F, so this must be an orange chord." And, because doing so makes the game so much easier, an adult will gladly and automatically make this strategic shift. Interval Loader has at least one function in absolute training: knowing the difference between scale degree and absolute pitch. During the run of The Fantasticks, I noticed that the harpist's instrument had red strings and blue strings which were placed at fourth and fifth intervals from each other; I supposed that one of the two colors was probably C, which would make the other color either F or G. While she was tuning up before one of the shows, I noticed that she had played an E, and I turned around to see where that string was in relation to the colored strings. Apparently the red string was C. I confirmed this with her, but the thing was this-- I hadn't recognized the tone because it was "E". I recognized it because it was a C-major mi. And I knew the difference. By contrast, for some reason my mind has decided it wanted to know A-flat, and by coincidence, that's the tone the harpist would use to tune up. The first time I heard it I was startled because I knew, unambiguously, that it was an A-flat. I knew this even though I had never trained myself on A-flat, and I knew I was not recognizing the minor sixth scale degree (which is still my worst interval in Interval Loader). I just heard an A-flat. I walked over and asked why she was tuning to A-flat, and it was only after she'd explained it to me that she wondered how I'd known. I notice the difference quite clearly during Chordhopper's in-game single-pitch session; when that A-flat pops up it feels so sturdy and stable and obvious that I always smile as I press my response. During Interval Loader, I always hear the A-flat sound no matter what the interval or scale degree, and sometimes I hear A-flat so strongly that I can't tell what the scale degree is no matter how many times I repeat it. Is all this progress? Well, yes, unquestionably. Am I learning absolute pitch? It's hard to say. What I am able to do now is obviously enough for an advertising testimonial if I wanted to gush that I've "learned perfect pitch"-- but that's not really my goal. I want to be able to use this skill to enjoy music as I do language. As James Randi often says: anyone can claim anything, but the only proof is in objective results.